On second Sundays, the community gathers for live music and a nourishing brunch. 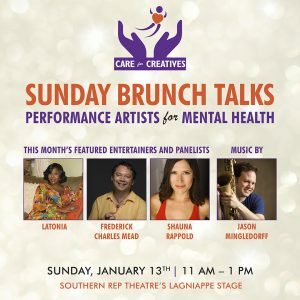 Talented guest performance artists entertain, followed by an open-hearted panel where performers share their personal stories about mental health, creativity, and hope for wellbeing. All community welcome! panel where performers share their personal stories about mental health, creativity, and hope for wellbeing. Care For Creatives is in partnership with the YOU GOT THIS Mental Health Outreach Program and the Performing Arts Medicine Association (PAMA).